Add Sparkle to Your Holiday! If you are like me, whenever you think of glitter you are bombarded with horrible visions of Mariah Carey and her painful attempts to act. But let's try to move past that for a moment. 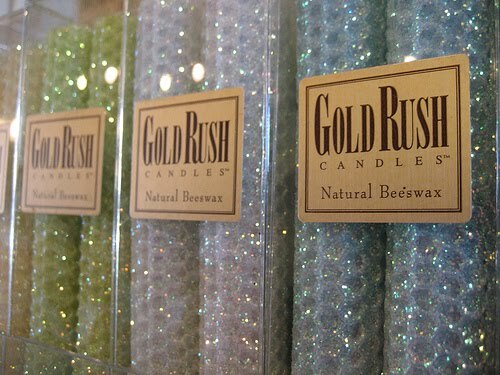 These natural handrolled beeswax glittered candles are one of my favorite holiday accessories. I always give my Mother Gold Rush candles for the season. They add a playful yet elegant look to your tablescape. The candles are by California Fleurish Inc. and come in 27 different colors! Many boutiques carry the line. I generally pick mine up at Maribou Gifts before I head back to Connecticut. They are advertised as having a slight honey wax fragrance, however, I can't smell it. I am allergic to most scents and find myself in awkward social situations all the time. I'm never sure if I should risk offending the host/hostess by asking them to remove the candle, or try to blow out the putrid scented candles when others are not looking? Generally my sneezing tips people off. These candles don't bother me at all. I highly recommend them.